The trees are blooming, the flowers are blossoming, and people all over Loveland are coughing, sneezing, and rubbing itchy eyes. It’s allergy season. No doubt that many people will be heading to their local drug store to purchase some medicine and then will hide away in their homes with the windows shut tight. But there are probably just as many people who don’t realize that their own home may not be offering as much protection as they think. 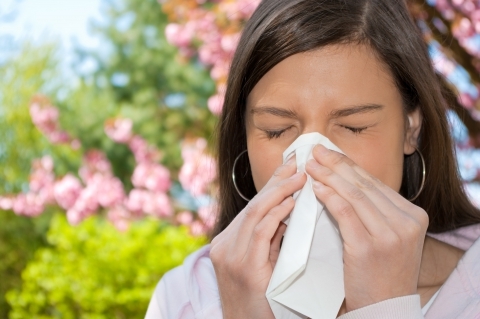 If you frequently turn on the air conditioner in your home, you could be unknowingly be spreading around allergens that are making the sneezing and itchy eyes worse. 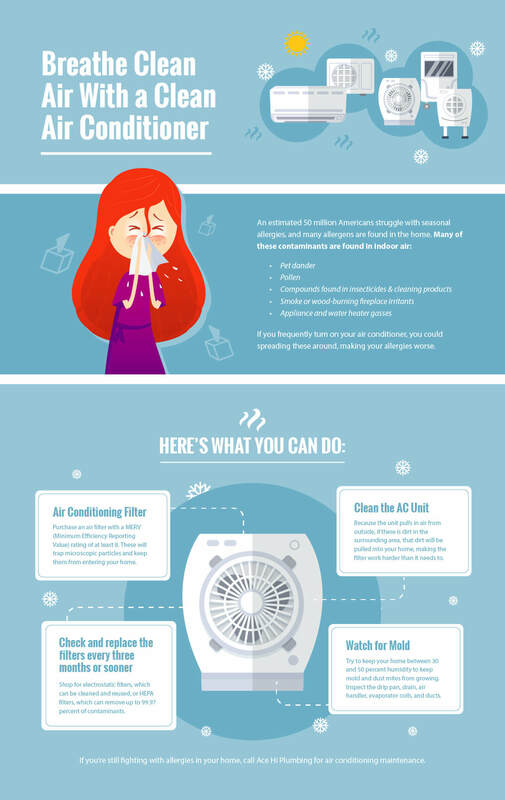 Air conditioning maintenance can go a long way in reducing these allergens in your home. Here are some other things you can do. Many homeowners overlook the importance of air filters. They are continuously fighting to keep contaminants out of the air your breathe. So if you don’t have a really good filter, or one that is old, dirty, and isn’t functioning efficiently, you’ll be breathing air that is full of allergens. When shopping for an air filter, look for its MERV rating, or Minimum Efficiency Reporting Value. The experts at Ace Hi Plumbing in Loveland recommend a rating that is at least eight, which is able to trap very small particles and keep them from your home. Once you have an efficient filter, the next step is to check and replace them regularly. Filters should be replaced at least every three month, or even sooner if they look dirty. Consider shopping for electrostatic filters, which can be cleaned and reused, or HEPA filters, which can remove up to 99.97 percent of contaminants. Unfortunately, cleaning never ends. Regularly check your air conditioning unit outside to ensure that dust and debris is cleared away. Because the unit pulls in air from outside, if there is dirt in the surrounding area, that will be pulled into your home, making the filter work harder than it needs to. Don’t forget about the inside, either. If you’d prefer a professional to look at the unit, give Ace Hi Plumbing a call for air conditioning maintenance. Mold isn’t as big of an issue in Loveland as it can be in more humid climates, but it’s still worth keeping an eye out for. Try to keep your home between 30 and 50 percent humidity, which will prevent mold and dust mites from developing. The drip pan, drain, air handler, evaporator coils, and ducts can all develop mold, so check them every two weeks or so. Having a professional HVAC company inspect and clean your air conditioning unit is never a bad idea. They know exactly what to look for and the best methods of cleaning it. Ace Hi Plumbing serves Loveland and the greater Front Range area with expert air conditioning maintenance, installation, and more. 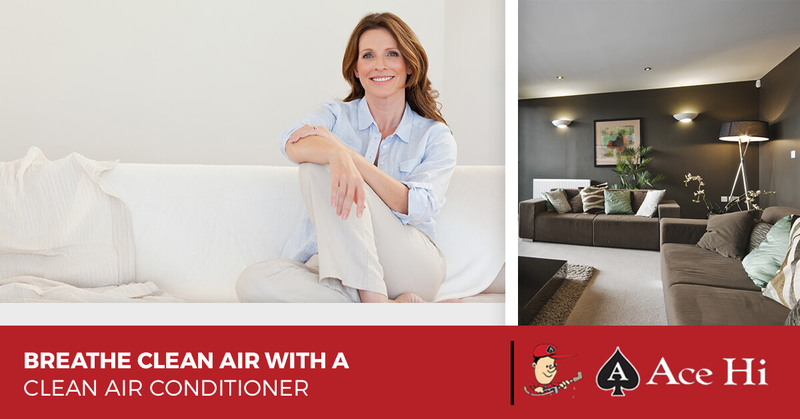 Whether you need a new system or just want it inspected and cleaned, after we leave your home (in the same condition as when we entered it, of course), you can be confident you’re breathing allergy-free air. Now try to get out there and enjoy the beautiful Loveland blossoms!